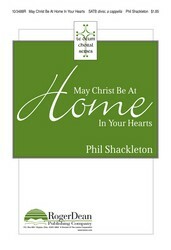 May Christ Be At Home In Your Hearts is a composition for mixed chorus. It’s available from Lorenz/Roger Dean Publishing. You can see part of it there, and also listen to a performance of it. Here is the amount of it that the publisher allows you to see, for purposes of review. It’s based on Ephesians 3:16-19 from the Living Bible paraphrase. © 2010 Phil Shackleton. All Rights Reserved.